Steve Kerr Unimpressed With Kevin Durant's Ejection In Game 1: "We Took The Bait"
Home>Sports> Steve Kerr Unimpressed With Kevin Durant's Ejection In Game 1: "We Took The Bait"
Kevin Durant got tangled in the web of known agitator Patrick Beverley. The Warriors opened up their account for a repeat Championship on a positive note yesterday, besting their first-round opponents the Los Angeles Clippers by a score of 121-104. The only blemish on the night from their perspective was a scuffle in the 4th quarter which saw Kevin Durant ejected after receiving a double technical for trash talking with Patrick Beverley a moment too long. The Clippers' guard suffered the same fate. The ref's decision to eject KD and Beverley wasn't based on reputation or a single altercation. The two players were jawing at each the whole way through, whenever they were checked into the game by their coaches - Beverley playing for 31 minutes in a losing effort, Durant one better, at 32. ESPN is reporting that Beverley incited the frustrations by mocking KD's flappable body movements. 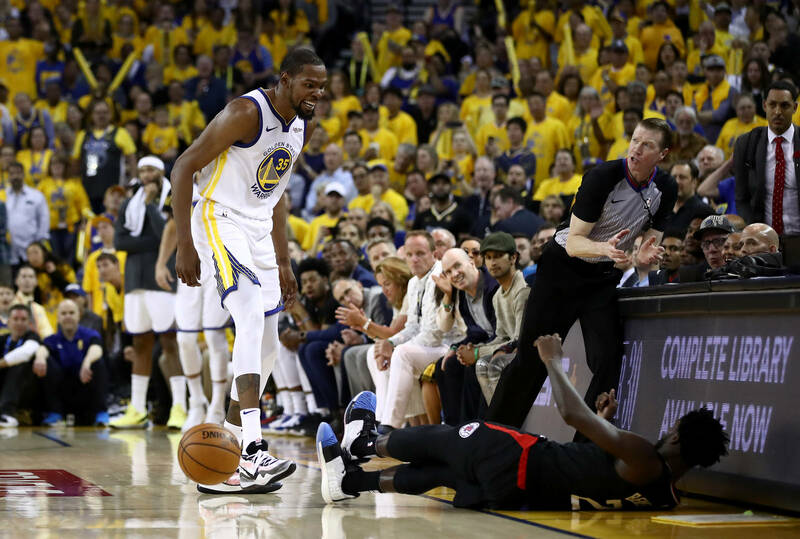 With Durant shrugging off the early incitement, Beverley was thereby motivated to up his agitations to another level, culminating in the players getting tangled up 19 seconds after the first set of technicals were issued by referee Ed Malloy. Let's just say, coach Kerr was not overly impressed with his star players lapse of concentration. "We took the bait," Kerr said post game. "[Durant] took the bait, and that's two technicals. You get seven technicals, your seventh one is a suspension in the playoffs. Whether you play four playoff games or 24, seven is the magic number. So he's got four to play with after one game." Game 2 is slated for Monday even at 10:30 pm ET at the soon to be deposed Oracle Arena. In what direction do you see this series going now that Beverley is clearly under Durant's skin? A sweep, 5, 6, an upset? Hit us with your thoughts in the comment section below the write-up. SPORTS Steve Kerr Unimpressed With Kevin Durant's Ejection In Game 1: "We Took The Bait"
Get the hottest music, news and videos delivered directly to your inbox. Tell me about Hot New Hip Hop news.